Develop your core strength with the help of Olympian, Commonwealth and European champion Fran Halsall’s Core Exercises for Swimmers. Sort your planks from your push-ups, with easy, medium or hard options. Let Fran’s core exercises for swimmers help you develop your swimming out of the pool. Click or tap the gallery button below to access Fran Halsall’s Core Exercises for swimmers. 1. Start in four-point kneeling position. 2. Tighten lower abdominal muscles. 3. Rest on forearms out in front. 4. Lower pelvis to floor until back is straight. 5. Aim to hold for 30 seconds to one minute. 1. Support yourself on forearms and toes. 3. Ensure a straight back. 4. Aim to hold for 30 seconds to one minute. 4. Raise one leg 30 cm off the ground maintaining straight leg and stable back. 3. Lower arms down until the nose just touches the floor. 4. Push back up into four-point kneeling position. 5. Aim to complete 8-12 reps once you can do that move on to standard push ups. 1. Support yourself on hands and toes. 3. Ensure a you maintain a straight back throughout. 4. Lower arms down until the nose just touches the floor. 5. Beginners aim for 6-8. Intermediate 8-12. Advanced 12-25. Fran says “this exercise is great for biceps, triceps, shoulders, pectorals and abdominals.”. 5. Explosively push up until your hands leave the floor. 6. Beginners aim for 4-6. Intermediate 6-10. Advanced 10. 1. Keep your head and eyes up. 2. Your feet should firmly on the floor about shoulder width apart. 3. Squat until your upper thighs are parallel to the floor. 4. Return slowly to the starting position. 5. Try for 10 reps.
3. Squat down until your upper thighs are parallel to the floor. 4. Then return up as fast and as powerfully as you can into a jump and repeat. 5. Try for between 10 and 20 reps.
3. Squat down on one leg until your upper thighs are parallel to the floor. 4. Return fast and powerfully to the starting position. 5. Try for 10 reps each leg. 1. Start in four point kneeling position with back straight and hips at 90 degrees. 2. Tighten your lower abdominals as you slowly raise one arm straight in front of you. 3. Try to keep your pelvis and back straight. 4. Bring your arm back in and relax then repeat with the opposite arm. 5. Try for 10 reps with each arm. 1. Lie on your front with your arms by your sides. 2. Tighten your lower abdominals as you stretch one arm out in front of you and the opposite leg out behind you. 3. Hold for five seconds and try not to let your pelvis twist. 4. Repeat with the other arm and leg and aim for 10 reps on each side. 5. Increase the difficulty by raising your arm and leg in the air rather than stretching them out behind you. Fran says this exercise is great for shoulders, lower back and glutes. 1. 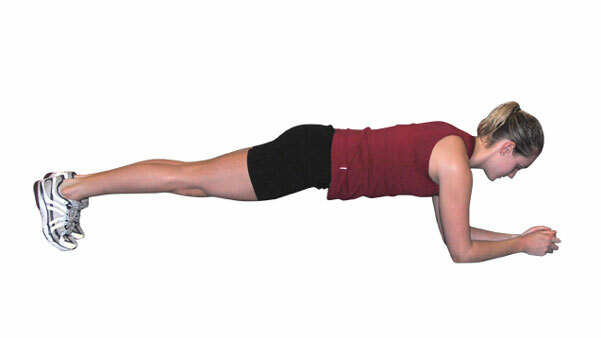 From a standing position, drop into a press up position. 2. Perform a squat thrust and return to the standing position. 3. Then drop into a squat and jump up as powerfully as you can. 4. Repeat for 10 reps. Try to gradually increase this up to 15 and then 20. Fran says this exercise is great for quadriceps, hamstrings and glutes. 1. From a standing position step forward with leading leg. 2. Squat down until the standing leg’s knee lightly touches the ground. 3. Then from this position drive back up to the start position and repeat with the other leg. 5. Try for 10 reps changing legs each time. 6. Make this exercise harder by repeating with the same leg for 10 reps, or jumping from a lunge on one leg to the other.